A leaked image from the Japanese First Guides distributed with the first Standard format flash decks reveals that not every clan will be getting Cardfight!! Vanguard's newest trigger type. "All of your front-row units gain +10000 Power. This is a trigger that only certain clans possess." 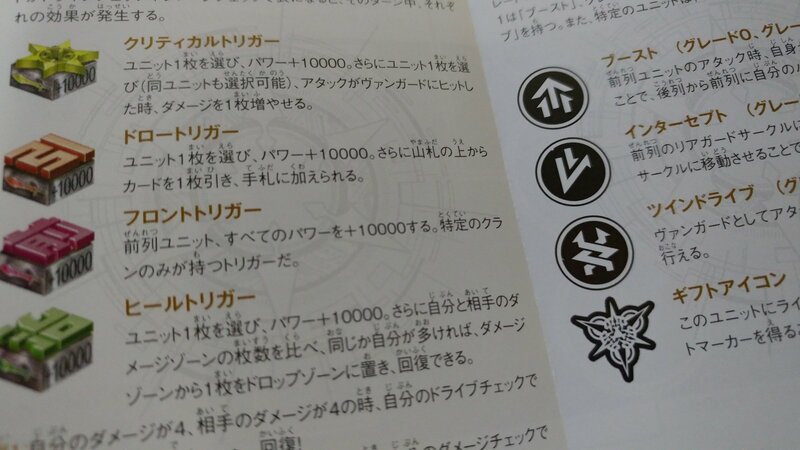 Also of note is that where the First Guide describes the different unit abilities like Boost and Intercept, no description of Triple Drive!!! is presented, reinforcing the idea that there will be no strides printed for Standard format. It is possible that Triple Drive!!! is not explained because none of the cards in the flash decks have this ability, but Front Triggers are also not present in either of these.